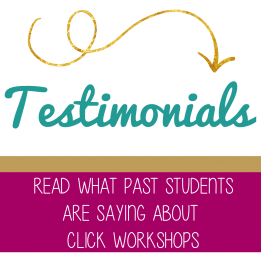 Click Workshops was started in 2009 when we realized there was a definite need for workshops in the Atlanta area. Our instructors are photographers themselves and approach the material in an easy to learn casual format that makes learning photography FUN! We’d love to see you in class! Why take a Click Workshop? © 2019 Photography Studios in Atlanta | Click Photography Studio|ProPhoto Blogsite Designed with love by Seaside Creative.